St. Isidore (c.560-636), bishop of Seville was a prolific writer, perhaps his most famous work being the encyclopaedic 'Etymologies'. His 'Sentences' are a compilation of theological excerpts, arranged in three books, drawn mostly from St. Gregory the Great and St. Augustine. An inscription on a flyleaf suggests that this manuscript was perhaps owned during the Middle Ages by the Franciscan convent in Bristol. 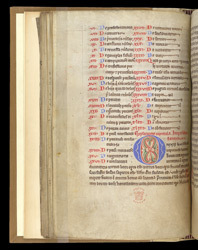 Most of this page is occupied by a list of chapters; this is followed by a rubric, and the start of Book II of the 'Sentences' with a blue initial 'O', five lines high, enclosing decoration in green, red, and a yellowish brown.